Optic neuritis (ON) is characterized by inflammation of the optic nerve with acute loss of vision in one eye. 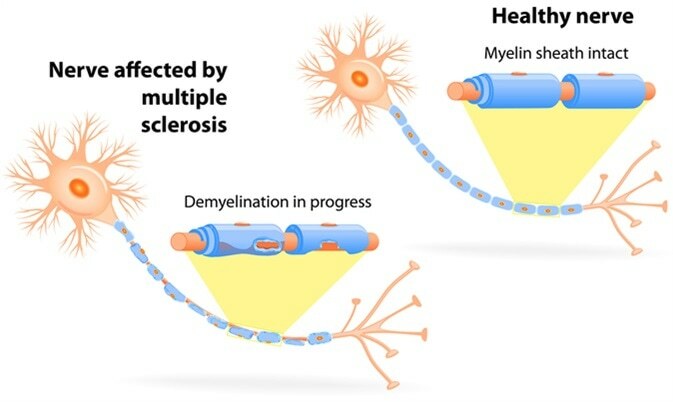 It is among the initial manifestations of multiple sclerosis (MS) and occurs secondary to demyelination. Most reported cases are associated with MS; however, it may occur in isolation. ON has been observed in approximately 20% of MS patients as an initial manifestation and in almost 50% of patients during the course of the disease. The Optic Neuritis Treatment Trial (ONTT) showed that after a 15-year follow-up period, almost half of ON patients had converted to clinically definite MS. Looking at the risk of conversion to MS, it is clear that prompt diagnosis and effective management of the affected patients is necessary. ON causes painful visual loss that mainly afflicts young adults, especially females is associated with a wide variety of symptoms, and. ON is characterized by symptoms such as visual defects, pain in the periorbital region, and problems with color vision. Vision defects may be mild or severe, such as loss of light perception, and are usually associated with prior pain. Periocular or retro-ocular pain accompanying eye movements is common among these patients. Defects in the visual field are observed in ON and may include focal defects or diffuse defects. ON is the most common initial manifestation of MS; however, it is difficult to predict the long-term prognosis. There are some important factors which may help predict the risk of conversion to MS and help with the long-term management of the disease. Factors such as patient demographics, genetics, neurological, and fundus findings are all important in predicting the risk. Neuroimaging using magnetic resonance imaging (MRI) can provide valuable insights in this regard. MRI of the brain, orbits, and spinal cord can be used for diagnosis, and these lesions in particular can be strong indicators of MS risk. The probability of developing MS increases with the number of lesions. The majority of patients with ON show abnormalities in white-matter T2 signal in an MRI scan. The McDonald criteria comprise a sensitive and accurate diagnostic tool used to predict the risk of conversion to MS. These have been updated to provide defined fixed criteria for DIS (dissemination in space) and DIT (dissemination in time) of CNS lesions, and assists with the detection of MS after a single episode of neurologic symptoms. McDonald criteria also aid in the differential diagnosis by excluding other diseases. Cerebrospinal fluid (CSF) analysis may also help in diagnosis; oligoclonal banding (OB) and immunoglobulin G (IgG) index are the most useful predictors of MS. The evoked potentials test is yet another extremely sensitive diagnostic tool used to predict disease risk even in asymptomatic or silent cases. Visual evoked potential (VEP) testing measures the electrical activity of the brain in response to a visual stimulus and detects the speed of propagation of the nerve impulse. Thus it can detect lesions even before the development of symptoms. Optical coherence tomography (OCT) is a recently developed and safe technique to determine the thickness of retinal nerve fibers and retinal tissues. The OCT test can determine the thinning of the nerve fiber layers in patients with prior ON. This test is useful to quantify the loss of optic nerve axons and hence helps in the assessment of disease progression. The treatment strategy in ON usually involves intravenous corticosteroid therapy such as methylprednisolone. Intravenous dexamethasone is also an option for patients with acute ON. Its ease of availability and low cost makes it an attractive alternative to methylprednisolone. However, even though steroids have been found to hasten recovery of vision initially, they have no effects on the final visual outcome. Immunomodulator and intravenous immunoglobulin therapy may be useful in patients with one or more lesions, however, the potential risk to benefit ratio should be assessed before starting therapy. Several studies have demonstrated useful insights regarding the clinical features of ON associated with MS; however, more understanding of the factors responsible for disease severity and better diagnostic tools are still required. This will help prevent inaccurate treatments and result in the adoption of the appropriate treatment strategy.